Tops on the list is Geron (GERN - Get Report), down 58% in March. Geron shares slid following the FDA's decision to place its lead drug imetelstat on clinical hold due to safety concerns, so it's not fair to blame the market weakness in March for its woes. At No. 2: Ceres (CERE, an agriculturial biotech company, down 37%. I don't think anyone cares about Ceres. My apologies if you do. 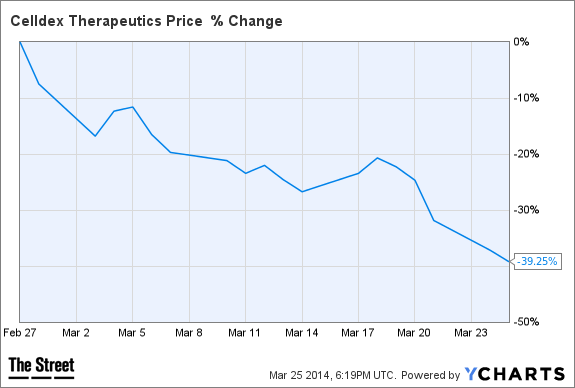 A trio of stocks tied in third place: Xoma (XOMA, Cytrx (CYTR - Get Report) and Celldex Therapeutics (CLDX - Get Report) have all lost 39% of their value in March. Cytrx's entanglement in a messy stock promotion scandal with the specter of an SEC investigation hovering of the stock easily explains the sell off. Xoma also issued some negative clinical data early in the month. Celldex is a bit tougher to figure out. Celldex has benefitted from inclusion in the "immuno-oncology" investing craze, so perhaps the selling we're seeing here is an unwinding of a biotech buzzword trade. 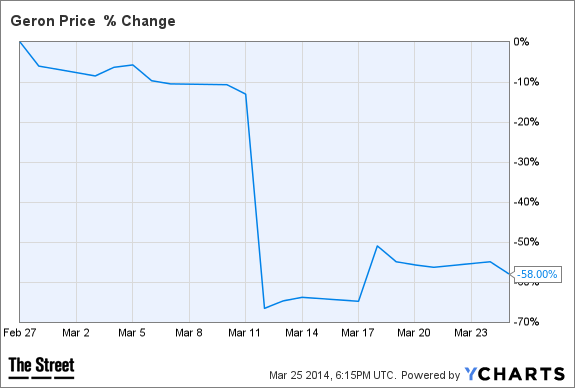 Next: NewLink Genetics (NLNK - Get Report) and Raptor Pharmaceuticals (RPTP both down 37% in March. NewLink is another over-valued cancer buzzword stock which is finally reverting back to the mean. Raptor is proof that orphan-drug disease stocks aren't all gravity proof, especially when you provide disappointing 2014 sales guidance. Other notably weak biotech and drug stocks in March: Agenus (AGEN - Get Report) (-33%), Galena Biopharma (GALE (-32%), Zogenix (ZGNX (-32%), Novavax (NVAX - Get Report) (-34%) and Oramed Pharmaceuticals (ORMP - Get Report) (-27%). The reasons for weakness in most of these should be self-evident.